My daughter always tells me I should start with a ‘positive’ so here goes: A warm church (no blanket required –MAGIC)! Throw in a Mistress and the revelation of a homosexual past and you may be forgiven in thinking that we are on track for yet another dreary reality show! What in fact we had was The Lion in Winter, the group’s Christmas offering. I was entertained by a well directed and produced play with an excellent cast and crew. Tristan and Patricia as the King and Queen worked very well together with excellent timing on the lines which enabled the audience to digest the script and pick up on the humour. Jof, Harry and Peter, as the sons, all brought their own style of acting to the play which gave a great mix of characters, all enjoyable to watch. Lasma as the Mistress played her part well, and with it being her first acting role and playing alongside ‘seasoned actors’ she fitted in nicely. Another first with Masque was Josh. I loved his portrayal of King Philip. He brought what appeared to be a calming influence with him whilst at the same time being quite ruthless when required. All the actors made good use of the ‘round’ which can be difficult with a small cast. Clarity was also good. The music fitted in nicely for the season and the mood of the play. However I must confess to a moment's lapse in concentration whilst listening to A Coventry Carol when I spotted Steve’s Led Zeppelin T-shirt and for a split second I was back at The Royal Albert Hall, June 1969 (but that is another story). I cannot finish this review without mentioning Roger The Retainer and his lovely assistant Clare. What wonderful movers! So to sum up the evening: I was fully entertained with a good production, hearing my first carol, enjoying my first mince pie and cup of tea (mulled wine not my thing) in the lovely atmosphere of the Holy Sepulchre. So to everyone concerned give yourselves a big pat on the back. 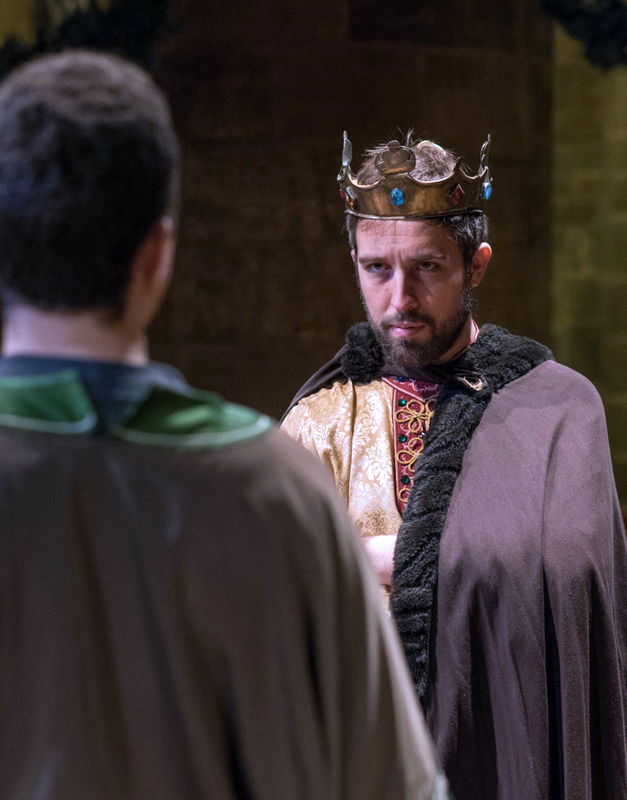 Given the interest in Magna Carta and King John this year, and as an add on to the success of Becket at the Guildhall, the production of Lion shows the Plantagenets warts and all. 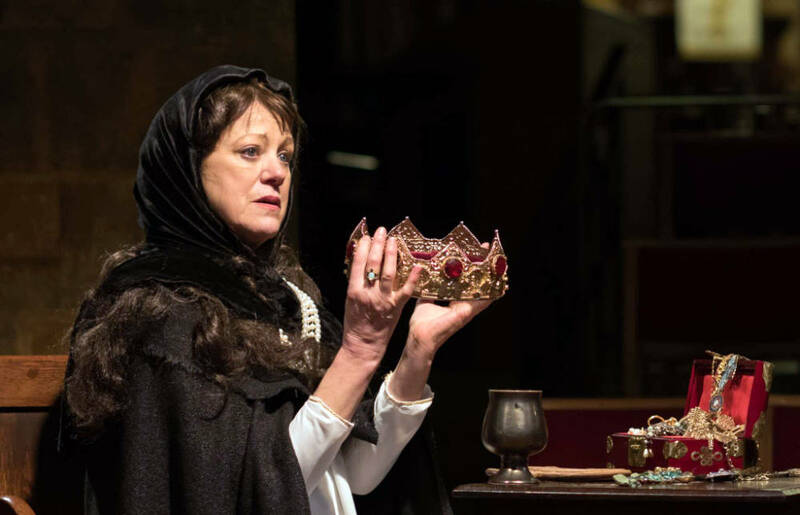 The play is set specifically at Christmas 1183 and King Henry is manoeuvring to get his younger son, John, first in line of succession rather than Richard, his elder son, supported by Queen Eleanor. Into this mix is added Geoffrey, the middle son, Alais, a French princess, and the young King Philip of France. "All families have their ups and downs." 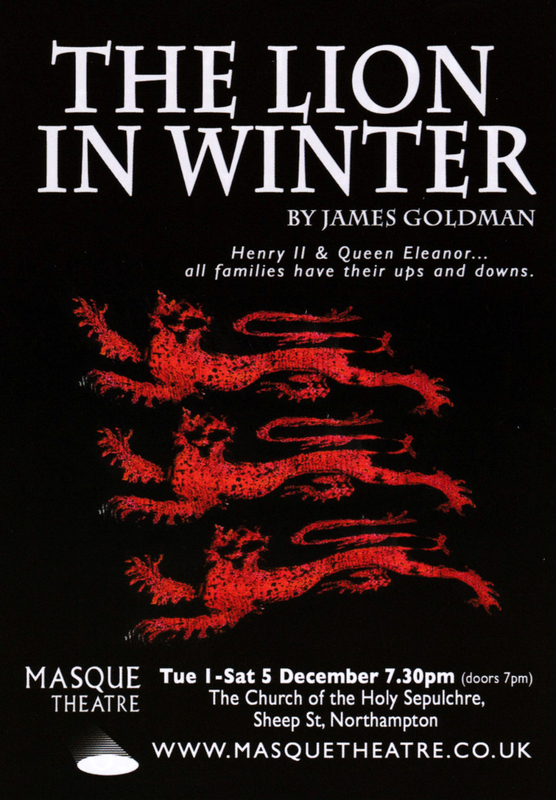 The play is loosely based on historical fact but is really a domestic drama and, though given the high stakes, as Eleanor says after having had a ferocious row with Henry ‘All families have their ups and downs’. Many of you will have seen the 1968 film with Peter O’Toole and Katherine Hepburn, and featuring Antony Hopkins as Richard. Equally some of you will have seen Patricia Coleman’s production for Masque in 2003 and it’s even possible some of the same costumes will be used!